If your corporate goals aren't clearly defined, communicated, and measured, CIO are missing out on an opportunity to encourage beneficial behaviors. CIOs may improve performance in one department or division at the expense of overall company performance. Janco suggests that organizations show how performance management efforts will benefit the enterprise if metrics and reporting align to corporate goals. To keep the cost of delivering goods and services in line, CIOs must continually find ways to reduce waste and eliminate inefficiencies. If operational wastefulness persists, CIOs can lose control of their cost structures - and that puts pressure on gross margins. Economic woes and restricted cash flows are forcing companies to analyze cost structures by delving deeper into the information already at their fingertips. Because of this, analysts point to a rising interest in business intelligence software. In today's business environment, an organization needs to address all outstanding issues - but CIOs must identify and prioritize existing problems, then focus their time and energy on the most crucial. No organization wants to wait until a product is drastically behind schedule or a department significantly over budget before taking action. However, if CIOs manually track project or program status, they risk not only wasting time and money on an ineffective approach but also delaying their ability to identify and then correct problems. When demand slows, the last thing CIOs want to do is to take their user base for granted by assuming existing users and customers will remain loyal through tough economic times. Instead, users and customers may be faced with their own financial difficulties or could be lured away by incentives from the competition. Staying in tune with the needs of the users and customer base and reacting appropriately can help shore up loyalty and maintain service levels. Even with limited investment funds, CIOs still have to make fact-based decisions about short- and long-term opportunities to grow top-line revenues. Many great technology advancements like SABRE (American Airlines) were launched during recessionary times and yet able to capitalize on unique market opportunities. To invest in and seize opportunities with confidence, CIOs need a solution that helps them see trends and variances, analyze scenarios, and select the right combination of initiatives to maximize enterprise returns. The job descriptions created by Janco's executive consultants have taken these changes in role into consideration when the job descriptions for the CIO and CTO where updated. 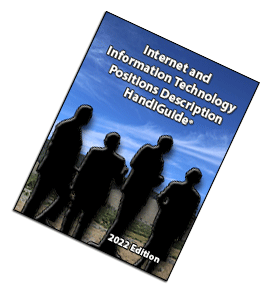 The Chief Information Officer and Chief Technology Officer job description are both over 4 pages in length. You can purchase this book as a PDF Book, Word Book or as individual word files for each Job Description (in both WORD 2003 .doc and Word .docx formats) which makes for easier modification. We have also combined the both book formats with the individual word files for each job descriptions to give you the best of both worlds.